The Ideasicle Paper Airplane, a variation on the "Harrier" model. A key ingredient to any creative endeavor is fun. 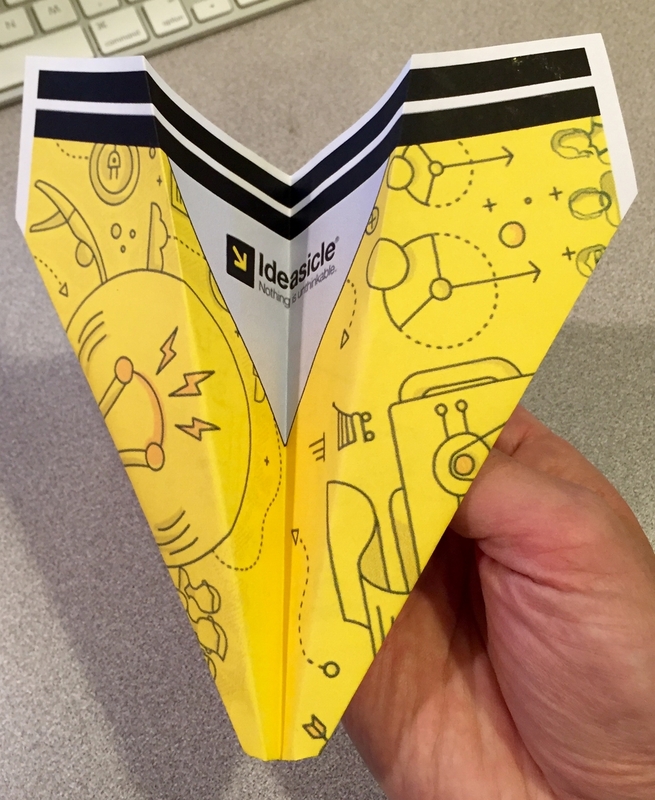 At Ideasicle we believe there is nothing more fun than paper airplanes. So we designed one in full Ideasicle branding. Follow the instructions below to make your own. But be forewarned. In making this airplane, ideas will hit you about that project you're working on. So have a pad ready. Click to expand and print out. #1: Click on the full page image to the left to expand the art file in your browser. Then right-click to download the file to your computer. Now open it and print in full color. Be sure to "fit to page" in the printing options so it's as big as possible on the page. #2: Once you've printed the page, flip it on its back as shown, with the black stripes just barely visible through the bottom of the page. Fold the page in half the long way and re-open. Then fold down the top-right and top-left corners, both meeting in the middle on the center crease. #3: Fold down the point at the top to the top of the first black line showing through from the other side. #4: Fold down the top-right and top-left corners only - and this is important - not flush to the center crease. You want the corners you're folding down to meet about an inch above the downward facing point (see image). #5: Fold up the little triangle point to cover the two flaps above it. #6: Holding in place the triangular flap you just folded up, fold the plane in half as shown. #6: Now fold each wing down where the 45 degree tops of the wings (the side that comes from the nose) is perfectly flush to the bottom of the plane. Repeat for the other wing. #7: Make sure all folds are nice and crisp. Then pull the wings open slightly so that, when the plane is pinched closed, the base and the wings make a Y shape when looking at it from the back. And then fly with a gentle toss. #8: Take a picture or video of your plane and post it to the Ideasicle Facebook page for all to see. We may even put it in our monthly newsletter.